Sergio Rivas, Alex Roldan and Anthony Ayala scored shootout goals to give Seattle a 1-0 win over host UNLV in a Western Athletic Conference men’s soccer tournament semifinal Friday. Sergio Rivas, Alex Roldan and Anthony Ayala scored shootout goals to give No. 23-ranked Seattle a 1-0 victory over UNLV in a Western Athletic Conference men’s soccer tournament semifinal Friday at Johann Memorial Field. 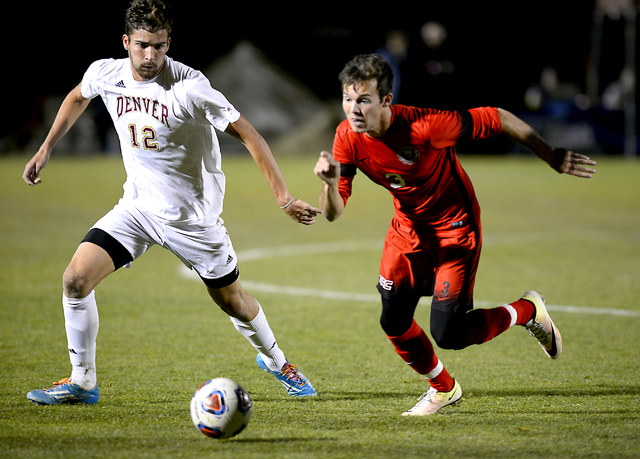 The Redhawks (14-3-3) next will face San Jose State (9-10-1), which notched a 1-0 upset over No. 12 Air Force (14-2-3), in Sunday’s final. Danny Musovski and Kevin Partida scored in the shootout for the Rebels (11-10), who held a 13-7 edge in shots through regulation and two 10-minute overtime periods, including a 5-3 advantage in shots on goal. Josh Adachi had five saves through regulation and the overtime periods and stopped shots by Tim Mehlich and Marco Gonzalez in the shootout for his 10th shutout of the season. Enrique Adame had three saves for UNLV. At Fertitta Tennis Complex, UNLV went 6-2 in singles and split four doubles matches on the opening day of the Rebel Invitational, with Aiwen Zhu, Anna Bogoslavets, En-Pei Huang, Izumi Asano, Juliet Zhang and Mercedes Lopez winning in straight sets. Competitors from Texas A&M, Purdue, North Carolina State, Arizona and Grand Canyon have joined the Rebels for the event. Zhu, ranked 83rd, downed Devin Chyphya of Arizona 6-1, 6-1 in the top draw. In the second flight, Bogoslavets topped Purdue’s Ena Babic 6-3, 6-3, and Huang beat Grand Canyon’s Celina Bhur 6-1, 6-0. Asano topped Texas A&M’s Riley McQuaid 6-4, 6-2 in the third flight, Zhang downed Grand Canyon’s Maya Etienne 6-0, 6-1 in the fourth flight, and Lopez beat Grand Canyon’s Audum Prudhome 6-2, 6-0 in the fifth flight. In doubles, Zhu and Huang teamed for an 8-4 win in the first flight, and Zhang and Asano won 8-3 in the second flight. The event continues Saturday and Sunday. At Seattle, senior Spencer Moore placed 84th in 21 minutes, 19.6 seconds to lead the Rebels to a 27th-place finish in the 36-team, 6-kilometer NCAA West Regional. No. 4-ranked San Francisco won the team title, buoyed by Charlotte Taylor’s first-place finish in 19:14.2. Also for UNLV, freshman Elisa Rovere was 148th in 22:18.6, freshman Palo Verde product Emma Wahlenmaier was 169th in 22:32.1, senior Green Valley product Lindy Eskin was 188th in 22:54.6, and freshman Liberty product Skyler Free was 191st in 22:58.2 in the 243-runner field. The team’s average time was 22:25 — 27 seconds faster than its average in 2016 — and it was helped by personal bests by Rovere, Wahlenmaier, Eskin and Free.